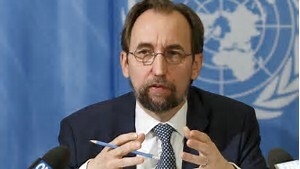 It is perhaps a sign of the times that Theresa May, the UK prime minister, should find herself quoted in the opening paragraph of a speech by the UN Commissioner Zeid Ra’ad Al Hussein. Not in a flattering way but quoting her remarks that human rights should be overturned if the ‘got in the way’ of the fight against terrorism. These remarks were made during the election campaign which did not go the way intended by Mrs May. They followed a terrorist attack in London. governments around the world. It seems that any idea that the UK is some kind of a beacon for civilised behaviour in an increasingly troubled world has all but gone. The desire to promote arms now matters more than the victims of their use for example in Yemen. Despite the appalling behaviour of the Chinese government, most recently with the death of Liu Xiaobo, our response is the minimum necessary: we are more interested in trade than decent behaviour. It is disappointing to see the prime minister of the UK being mentioned in this way because whatever her faults, there is no comparison between the behaviour of her government and that say, of Russia, where journalists and opposition politicians are gunned down and which has been described as a mafia state. The activities of governments in the Gulf also leave a great deal to be desired. There are many other countries in the world where autocratic regimes mistreat their citizens, use torture routinely, violently put down peaceful protests and deny freedom of expression. The remarks were perhaps made more in sorrow reflecting the fact that it was the UK government after the war which was one of those who were active in promoting the role of international law and human rights. Today, Al Hussein notes in his speech, for some politicians see human rights as an ‘irritating check on expediency.’ Some are indifferent to the effects of austerity on their own citizens. Although some members of the government seek to reduce the influence of human rights in our society, not all do and the organisation Bright Blue, which describes itself as an independent think tank and pressure group for liberal conservatism, has recently published a report arguing that the Conservatives should make Britain the ‘home of human rights.’ Clearly some fundamental attitudes will have to change if that ambition is to be realised. This report is also well worth a read. Unless countries like Britain and the USA are willing to provide moral leadership then a further deterioration in human rights around the world is to be expected.